Amina used to spend almost half of the day in fetching water for her family. “We had been drinking water from streams and ponds since childhood. The nearest pond is located at a walk of more than an hour”, she said during a sharing session at the Village Development Group VDG of Gadap Town. The situation of Amina is not different than other women of Khair Muhammad Goth (village). Her jobs include cooking food for the whole family, feeding and cleaning the animals, minding the children, delivering food to her husband in the fields, toiling the land and harvesting. “I wake up when it’s dark and there is just no time to rest. Things became really tough when I get sick”, said mother of five. Caritas Pakistan Karachi is running such groups in the most backward area of the metropolitan. 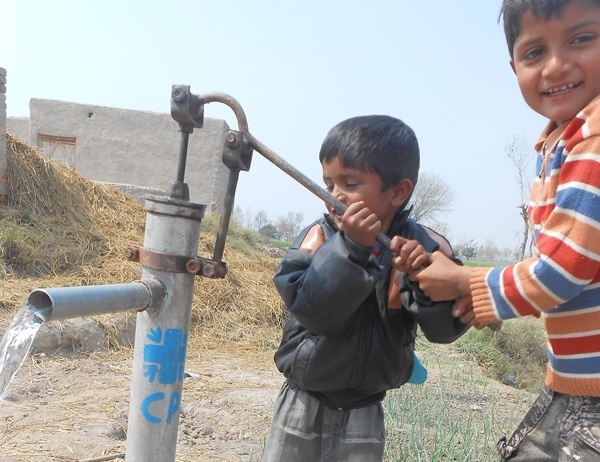 10 big hand pumps have been installed in Gadap Town this year. Khair Muhammad Goth was among the list of target areas and this means a sigh of relief for Amina. “We are lucky to have fresh water now. My children take bath twice a day, earlier it was only a Friday routine. Thank you Caritas!”.